Equine therapy is also called Equine Assisted Psychotherapy and Learning (EAP/L). It is often also interchangeably used with Equine Facilitated Psychotherapy and Learning (EFP/L). 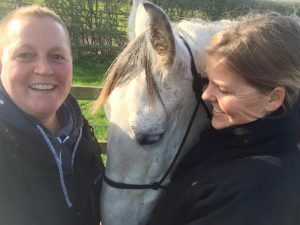 It utilises activities in the presence of horse to explore ways a client sees and relates to themselves and others, their patterns of behaviour and survival as well as their gifts and strengths, and may include the exploration of past experiences and traumas. EAP/L is a form of psychotherapy and relies upon the therapeutic knowledge and experience gained through a mental health qualification. It is often much more efficient at getting to the core of things, without being necessarily verbal. EAP/L uses equine-facilitated activities as a tool for self-development and education, with a focus on the immediate past and the present moment. This would be used more in leadership development and coaching. EAP/L can be effective for groups, couples or individuals. It can help address various issues including trauma, addictions, self-esteem, boundaries, relationship issues, identity issues, bereavement and loss, depression and anxiety. 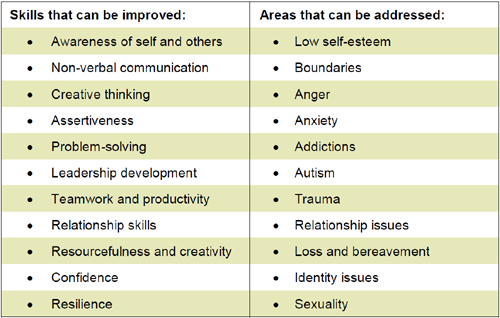 It can help us become more aware of ourselves and others, encourage creative thinking and problem solving skills, increase assertiveness skills, motivation, confidence and resilience. None of these activities involves actual riding. All is based on the ground and more around how we relate with these equine facilitators. Clients do not have to have any experience with horses. Research is constantly updated on the way experience is coded and can be interpreted through verbal and non-verbal patterns and physiological changes. Specific techniques enable clients to experience the effects of conscious and unconscious patterns of behaviour, memories and goals, and initiate opportunities for lasting change, which are monitored by observable results. During the sessions clients can expect to work with their main facilitator who may work with another team member where each take on most commonly a different role (e.g. Mental Health Specialist vs. Horse Specialist or a combination of this in a primary and secondary supportive role). This is to ensure safety and more effective facilitation. One more supporting staff may be onsite to help with administrative tasks, refreshments, horse care etc. For larger groups there may be more than two facilitators required. Clients can expect to work with one or more horses at each time. No riding is required and all exercises will be on the ground. The number of sessions varies according to the client and their requirements although the total time is usually briefer compared to traditional therapeutic methods. Though other animals have been utilised to facilitate psychotherapeutic work, horses are unique as they are herd and prey animals. As such they are very attuned to their surroundings and are able to pick up the subtlest energies in the herd and in the environment, crucial to their survival out in the wild. Because of this ability, they can be affected by these different energies and immediately reflect this through their body language and their behaviour. This can be very useful in the psychotherapeutic work, where the emotional or mental state of mind of the client can be picked up by the horse and mirrored back. This is helpful as it can point out unresolved issues and areas that require further work. It is this ability that can reduce the time spent in the usual way of talking therapies, where many resistances and defences come into play. In the workplace, for teamwork and leadership coaching, horses can be equally effective at exposing common problems or weaknesses within the team dynamics. Is the team leader effective at having willing followers that create efficient and effective teams which people are happy to be a part of? Are the team members rebellious or finding it difficult to trust in the abilities or congruence of the team leader? Are there other challenges within the team dynamics? The horses can show, with astounding clarity and in a gentle non-judgemental way, where the issues lie. This allows for a more positive way to approach change and improvement to help teams become more effective and productive when working together. How Could Equine Therapy Help? Horses and humans have long historic connections working and living side-by-side. 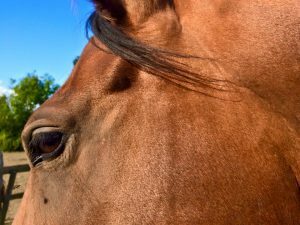 Neuroscience has shown us remarkable similarities between the limbic (emotional) brain of horses and humans, which make it possible for horses to serve as both our mirrors and our teachers in terms of understanding ourselves, our emotional life, and the way we relate to ourselves and those around us. EAP/L gives us opportunities to interact and form relationships with horses, and to learn from these experiences in a way that involves us physically, emotionally and mentally. Lessons learnt in this holistic way can be more easily absorbed and remembered, resulting in lasting and positive changes that can be transferred to the world of human-human relating. These intelligent, sensitive creatures live entirely in the present, offering us patience, immediate feedback, forgiveness, and another chance when we get it wrong. Do we always know how we are feeling? Are we always aware of how we are behaving or affecting others? Horses are radars for incongruence, and will reward us when we behave in a way that is in line with who we really are and what we truly feel. 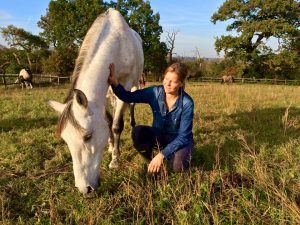 Horses can be incredibly adept in mirroring our true underlying emotions, and as a result, it is difficult to hide our fears and pretences, therefore non-judgementally encouraging us towards more congruence and authenticity with ourselves. Because this type of learning is fully experiential, neural connections and pathways can be newly established integrating this knowledge in an embodied way. It is thought that this allows for a faster intuitive ‘recall’ of this learning that is then transferable into our day-to-day lives. This in turn can create more sustainable and effective positive change. 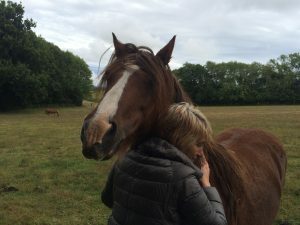 For more information and articles on this topic see our other blog posts 7 Top Reasons Why Horses Can Change Your Life and The Horse as a Therapist – Harnessing the Healing Power and Intuitive Wisdom of Horses. Our Equine Assisted Somatic Intelligence (EASI) programmes are usually provided around and outside of London and other parts of world (Cape Town, South Africa). Click here to book your session or to find out more. See also our recent blog post and in our glossary section for more.